Description This is the replacement glass tube for.. Description If you are looking for a protective ca.. Description This drip tip is made of Delrin. it is.. 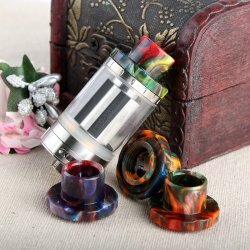 Description This drip tip is made of Aluminum. it .. Description This drip tip is made of Acrylic. it i.. Description This drip tip is made of Resin. it is .. Description If you are looking for a dirp tip for .. This drip tip is also working with TFV8/TFV12/TFV8.. Description This is the replacement O ring sealing..
News: Fresh Stock for Daedalus Coil Tool With Fast..
News: First Batch Stock for Vaporesso Tarot Nano v..
News: Currently we can receive the pre-order for 1..
NEWS: First Batch Stock forIJOY LIMITLESS RDTA Cla..
News:we can accept the pre-sell for Magic Winds RT..
News : OBS Engine Mini RTA Tank is in stock with F..
News : Fresh Stock for 24mm CoilArt Toruk Ta..
NEWS: Currently we have the Coil Master 521 mini T..